There’s a lot going on in workspace design these days: third space, in-between space, shared space, communal space, coworking space, activity-based space, makerspace. The list is (almost) endless—and full of potential. Across industries and locales, the large and inefficiently planned offices of the 1980s, originally designed to cater to the needs of executives and a wildly different level of technology, are being reimagined as collaborative, connected spaces that support the work of all. Many of those outdated 1980s offices (82%, in fact) are in urban buildings built before 1990. And they look their age, their lobbies rife with busily colored marbles and granites, shiny brass accents, and dimly lit unused space. Yesterday’s buildings simply can’t support tomorrow’s workforce—unless of course, they can. Here’s where repositioning comes in. A glossier term for renovation, the gist is the same: Take something old and make it new again. In Washington DC—which has seen nearly a decade of repositioning efforts within its built environment already—11% of office space is set to be overhauled in the coming years. Also happening in DC, and other major cities? The rise of new construction and “trophy” buildings are grossly surpassing existing Class A towers in design and amenities. So how does an older building keep up? “Owners of these older buildings are investing in them to compete for today’s tenants, and the most successful ones are those that really take the time and dollars to do it right,” says Lewis. Even with the substantial capital required, repositioning ends up being a prime option for owners and developers compared to building new. Once renovated, repositioned buildings get higher rents, have lower vacancy rates, and spend a shorter time on the market. 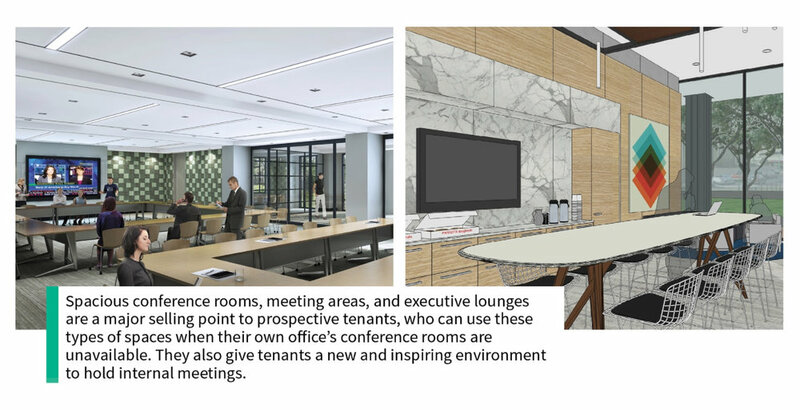 Understanding this shift toward lifestyle design is crucial to successful office tower repositioning, say principals Burt Pinnock, AIA, and Susan Orange, CID, who respectively serve as lead architect and director of workplace strategies on many of these projects. “But really consider the context of the workplace 30 years ago,” adds Susan, when many of these buildings were last touched. “Then, work was a place that emulated success. Work was a long-term commitment, a physical place that molded who a worker was or would be.” Stature, upward mobility, and wealth—these were all valued ideals reflected in the design, which is why opulent competing materials saturated lobbies. So how exactly do you strategically update outdated spaces—in both aesthetic and function—in such a way building owners and their potential tenants get what they want (and need)? Here are five steps we’ve taken in recent projects to accomplish just that. You start by designing an adaptable space that’s easy to add to or subtract from. Think of public spaces in an office high-rise like a little black dress: simple, elegant, and understated—a neutral base is key. Swap the outdated materials and finishes for lighter, brighter choices. Instead of pink granite, think ivory or beige travertine. Instead of dark cherry wood paneling, think neutral white walls. Instead of shiny brass fixtures, opt for a mix of matte metals. And in terms of scale, streamline design details like bulky columns to a human scale; rightsizing features like that will encourage people to sit, stay, and work. Then (just like with a little black dress) you accessorize, adding pops of color and texture with items like artwork and furniture, which can be updated more regularly and cost-effectively. One of the most requested amenities tenants are looking for in an office environment is undefined, informal space for any number of activities. Today’s tech allows workers to set up shop almost anywhere, which means in-between spaces like lobbies and rooftop terraces or plazas can be transformed into places employees can use to work, collaborate, and refresh throughout the day. In fact, nearly four decades worth of research indicates that the more control an employee feels they have over where and how they work, the more engaged they are. Taking advantage of these spaces to deliver that added value to a tenant makes good business sense. 3. Offer shared business amenities. As many businesses are in the process of rightsizing their office space, they’re looking for ways to reduce their footprint while maximizing efficiency. As square foot per person decreases and overall density increases, shared spaces like conference and event centers and meeting areas equipped with the latest technology are also high on the list for tenant requirements. Shared business amenities, complete with online scheduling platforms, are an attractive feature because it means tenants don’t have to provide as many of these spaces within their own square footage. For many of the buildings that Chris and Jeff own, adding a locally-owned restaurant provides tenants access to a great food option, while also gaining an additional tenant (the restaurateur). 5. Connect to the surrounding neighborhood. When you walk into the lobby of one of these buildings, it should feel like an extension of the streetscape, says Matthew. That’s why a well-done repositioning doesn’t take just interior spaces into account. Incorporating natural light as much as possible is a strong first step to doing this. Another tactic? Orienting seating areas and meeting zones toward whatever green space the building has, like a courtyard or nearby park. What we’re seeing in office towers across Richmond, Norfolk, and Washington DC is only a sliver of a much larger movement. Left untouched, buildings of the 1980s can’t compete with tenants looking for a community atmosphere in flexible environments ready to accommodate wildly diverse needs. The good news? These buildings were designed specifically for people to work inside of them. “They have fantastic bones—we just need to use them,” says Lewis. And repositioning can jumpstart powerful change without long lead times and hefty fees. We shortened this story just a bit. You can read the extended version on Baskervill's site and check our more of their projects too.